After the relative disappointment of what turned out to be Chris Fujiwara’s final stint as Artistic Director, I was genuinely considering skipping Edinburgh this year, for the first time since 2001. However, when it was announced that Mark Adams was taking the job, my Edinburgh-loving heart soared, as he’s the perfect person for the job – he has the right connections, great relationships with distributors and, as someone who attends pretty much every film festival going, he also has the right instincts for what makes a film festival great. On the evidence of this year, I cannot wait to see what he comes up with next year, given a full 12 months to put the programme together. Programme-wise, there were several signs this year that the festival was back on track, not least the return of the latest Pixar film as the centrepiece animated feature. 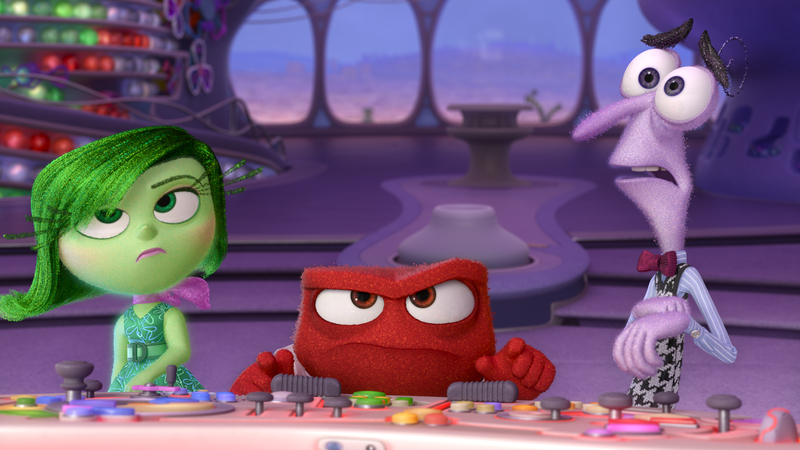 In fact, Inside Out ended up being my favourite film of the festival. Even by Pixar’s already astronomical standards, it’s an incredible piece of work: beautifully designed, laugh-out-loud funny and powerfully moving. I was an emotional wreck by the end of it. It’s also brilliantly conceived – the visual conceptualisation of how memory makes up a fully-rounded personality is inspired. I hope it ends up getting shown in schools. On the face of it, Adams appears to have got his feet under the desk pretty swiftly, though there’s no way to know how much of the eventual programme was his work, and how much was down to the rest of the programming team. Either way, the early news of this year’s line up seemed to be greeted positively. Last year’s opening film, Hyena, felt like the choice of a Festival that was looking for a fight. This year’s seemed more like a plea for a slightly boozy group hug. The Legend of Barney Thomson offered a home-grown star making his directorial debut (Robert Carlyle), a Scottish setting, and a streak of black comedy that wouldn’t unduly upset your granny. Something to please the press, the funding bodies and audiences, it was a very canny choice. Still, it could have been much worse: they could have been stuck with Scottish Mussel, a leaden, would-be comedy written, directed by and co-starring Talulah Riley. I would have loved to have been able to recommend this (the cast also includes the ever-watchable Martin Compston) but it only confirmed that the logo of Unstoppable Entertainment at the start of a film is your cue to flee the cinema. The Festival’s laudable commitment to British productions does have the unfortunate effect of inflicting several amateurish efforts like this on us every year. 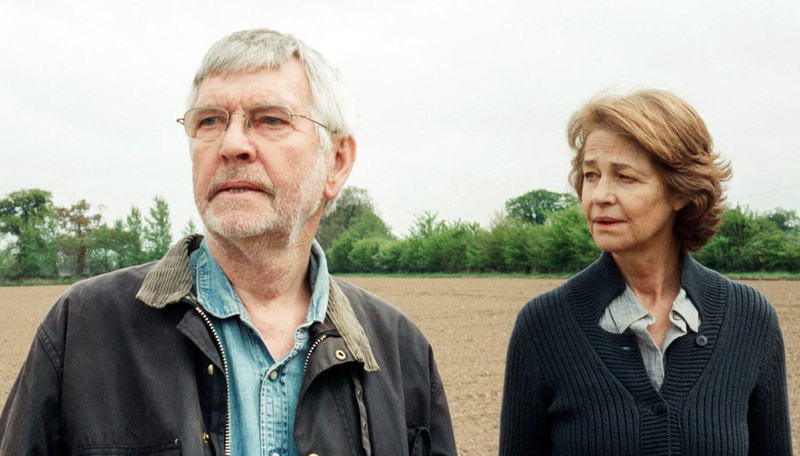 Thankfully, it also brought us 45 Years, which stars Tom Courtenay (who also cropped up in the documentary The First Film, where he was helpfully captioned as ‘Yorkshire’s Greatest Actor’) and Charlotte Rampling as a long-married couple whose relationship is strained when the body of Courtenay’s former girlfriend is discovered in the Swiss Alps. The film justly won the Michael Powell Award; it goes on general release on 28 August. One very good British film worth mentioning is Chicken. Chicken tells the story of a 15 year old boy with learning difficulties who lives with his older brother in a caravan. It has raw powerful emotional scenes dealing with their sometimes violent relationship, tempered by Richard’s beautifully innocent and optimistic view of life (the chicken is his best friend). Chicken can make uncomfortable viewing but all things considered is a well balanced and important film to watch. From Ireland came You’re Ugly Too, which concerns the relationship of an 11 year old girl who goes to live with her uncle, recently released from jail to care for her after her mother’s death. Narrowly missing out on top 5 places were The Diary of a Teenage Girl, which picked up the award for Best International Feature. Bel Pooley stars as the eponymous diarist, chronicling a number of sexual adventures, including an affair with her mother’s partner. A number of scenes made for uncomfortable viewing, but I liked the film’s refusal to judge its protagonists, even when they were acting in ways that an actual judge would come down pretty harshly on. I also enjoyed The Circle, a Swedish entry in the next Twilight/Hunger Games stakes. Based on the first in a trilogy about teenage witches, it was on the leisurely side, but a wider release rather than a remake would be deserved. In our round-up piece last year, I wrote about how it was easy to pick a top five, but I’d struggled to find ten good films for a top ten. This year, it’s a very different story – the fifth spot in my top five could have gone to any one of about fifteen films, such was the quality of the programme this year. During Fujiwara’s tenure, I often said that the festival needed big enough films to get people to open up the programme in the first place, and I think that they achieved that this year with Inside Out, Amy, Love & Mercy and The Diary of a Teenage Girl (which I would liken to Ghost World, one of the highlights of my first ever Edinburgh in 2001), as well as the likes of high profile indies like Fresno, The D Train and Sleeping With Other People (even if the latter was one of my few disappointments). I managed an entirely respectable 45 films this year, 3 above my usual Edinburgh average, though I also did far fewer interviews than usual, so that meant there was more time. Of those 45, there were only three that were actively terrible (you and Sam both walked out of one of them – it didn’t get better) and maybe only a very small handful on top of that that I wouldn’t have happily recommended. The rest of my Top Five looks like this. I touched on Inside Out above, and I don’t have much to add to what’s already been said about Diary of a Teenage Girl, other than to reiterate the Ghost World resonance and to agree with you about the uncomfortable nature of the premise, though I think that ultimately worked in its favour. The Newsroom – Off the Record was a thoroughly gripping documentary about a Danish tabloid fighting to stave off ever-declining print sales, by making cutbacks and launching an online version of the site. The production was blessed with impressive access, a gift of a lead character in editor Poul Madsen and the emergence of a riveting storyline involving two Danish hostages. A must-see for anyone interested in the decline of print journalism debate. I agonised for hours over what to include in the fifth spot and changed the list several times, but in the end, I went for Chicken. As well as strong lead performances from Scott Chambers and Morgan Watkins, the film had moments of raw emotional power, and I found myself thinking about it and talking about it with people for days afterwards. Special mentions would go to five other films, each of which could easily have made the Top Five. They are: Andrew Haigh’s 45 Years, a slow-burning follow-up to Weekend, that, as you say, deservedly won the Michael Powell award; Australian ex-con-visits-former-cellmate thriller Cut Snake, that went in an enjoyably unexpected direction; hotel maid black comedy Fresno, which had a pair of terrific comic performances from Natasha Lyonne and Judy Greer, both of whom are too often relegated to support roles; low-budget sci-fi thriller Uncanny; and enjoyable, informative 2000AD doc Future Shock! The Story of 2000AD. Other than interview access being weirdly harder this year, I don’t have too many regrets. I wish I’d caught the late-night screening of lion exploitation thriller Roar, and I would have liked to have seen at least one of the films in the Walter Hill retrospective (I’d have gone with The Long Riders or The Driver), but circumstances intervened. I did manage to get to the late-night screening of Salem’s Lot though, which a) I’d never seen before and b) was a lot of fun. I was particularly amused by the final line – “I’m sorry, Susan”, which attempts to compensate for the fact that the theatrical version omits the final fate of Bonnie Bedelia’s character. Poor old Susan. As always if there was only more time there are many more that I wish I could’ve gotten around to seeing with The Wolfpack, The D Train, The Stanford Prison Experiment and Every Secret Thing. It was difficult this year as I was there a shorter time and missed some of the screenings I would have loved to attend. This year’s line-up definitely had more in the way of big laughs than the last few festivals have managed. I want to single out a trio of wonderful gags in particular: first, the joke from Inside Out about Facts and Opinions getting muddled up in people’s brains (“Oh, that happens all the time…”); second a wonderful running joke in French-Canadian teenage girl comedy Tu Dors Nicole, about a young boy whose voice has deepened prematurely who keeps hitting on the young lead (part of the gag being that his thoughtful, mature dialogue makes him sound like he’s straight out of a French New Wave film); and third, Alice Lowe turning a Tesco receipt into performance poetry in Black Mountain Poets. My favourite film of this year was by far and away the wonderful Uncanny. I saw this by chance (nothing else was on) as I had not been drawn to it when reading through the programme. A brilliantly put together film that had the unfortunate timing of coming after (though being shot before) the very similar Ex Machina. 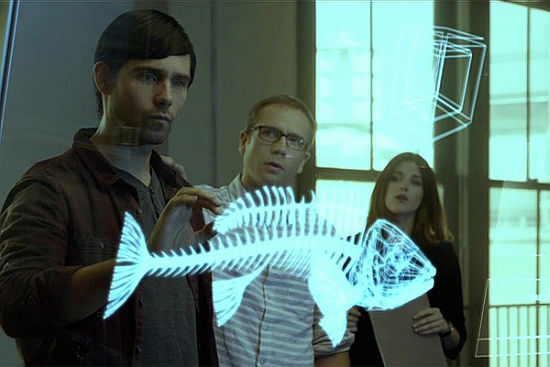 In my opinion though Uncanny is by far the better of the two with the story presenting enough questions to cause me to immediately want to watch it again and see if I can uncover the clues to the ending! It’s worth watching both to compare and contrast how a similar story can be portrayed in strikingly different ways. Maggie, starring Arnold Schwarzenegger, didn’t seem to go down to well with others but I thought it was an interesting if slightly misguided film. A teenage girl (Abigail Breslin) is bitten by a zombie and is taken home to be looked after by her Dad (Arnie) until such time as she will need to be returned to a facility and given a serum to end her life. The main problem lies in the expectations the combination of Arnie and zombies conjures up in your mind whereas this story is more concerned with the struggle of a father watching helplessly as his daughter dies. It was good to see Arnie do some “proper” acting and is a more than competent attempt at this style of film. Well worth a look. All in all, this felt like a quote-unquote “proper” Edinburgh again, to me, and I really didn’t think I’d be saying that, so that’s a huge step in the right direction. Part of the reason for that was the fact that the Filmhouse Bar had a late licence again (something that’s been absent for at least 4 years), with members of the public, press and filmmakers alike all mingling till 3am, restoring a real sense of atmosphere in the process. I’m genuinely looking forward to coming back next year. Isn’t Steve Saxon surely Yorkshire’s greatest actor?